I recently went to the Harvard Museum of Natural History, where they're hosting a special exhibit called "The Language of Color." I'm always looking for color inspiration for our furniture and clocks, so I was (dorkily) excited to move through the show and learn more about the important communicative role that color plays in the natural world. Also, you know, it's eye candy! There's a really interesting video in the exhibition about how a zebra's stripes may function. A couple of theories: to allow the animals to blend into one another and confuse dangerous predatory animals, and to resist pesky flies, who can't distinguish the stripes with their multi-lensed eyes (ew). Most of us could probably guess that male butterflies, like other animals, have evolved their flashy colors to attract mates. But I learned in the exhibition that females are also drawn to UV-reflective markings on males, which are invisible to the human eye. Makes you wonder what else we're missing out on, huh? Many birds (like flamingos and goldfinches) are the same colors as the food they ingest. 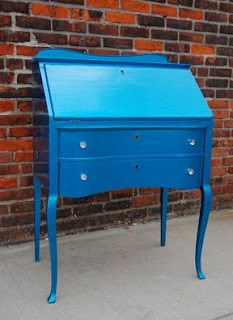 Clearly, this Super Blue Writing Desk has eaten a diet consisting primarily of blue M&Ms. Even the inside is a chocolate-y brown. However, tests show the desk will neither melt in your mouth, nor in your hand. 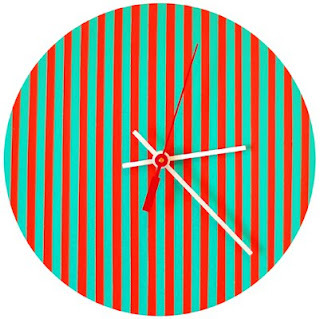 Much like zebras, this clock must have developed its stripes over time to confuse predators. When in a large pack, their boundaries blurred, predators can't for the life of them read the time, rendering them hopelessly late for important appointments. And speaking of camouflage, judging by the colorful squares on these pieces, I'd say we're looking at a genuine pair of wild confetti factory dressers. Very rare, indeed! You can catch "The Language of Color" exhibition at the Harvard Museum of Natural History until March 28, 2010.